Berlin — To recall an ancient jingle by The Mamas and the Papas, “Oh, Monday morning / You gave me no warning / Of what was to be.” Monday morning is when Europeans woke up this week to the disturbing results of the Italian parliamentary elections, which more than overshadowed some bits of slightly more reassuring political news from Germany and, oddly, Switzerland. Okay, enough Oldies but Goodies. Let’s have the facts. In the March 4, 2018 Italian elections, outlier protest parties raked in at least half the votes. The Five-Star Movement (M5S), an Internet-based, born-yesterday formation, headed by 31-year-old Luigi de Maio, and not readily identifiable as fitting into the traditional left-right spectrum, led the multi-party pack with almost 33 per cent of the tally. 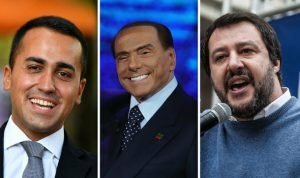 Di Maio (l.), Berlusconi (c.), Salvini (r). Meanwhile, a very right-of-centre 3-party coalition (made up of Lega, or The League; plus Forza Italia, led by 81-year-old former prime minister Silvio Berlusconi; and the even further right Brothers of Italy / Fratelli d’Italia) rolled up some 37 per cent of the total. The traditional center-left Democratic Party (DP), led by former PM Matteo Renzi, limped in with just under 19 per cent (a fraction bumped up to 23 per cent when its left-center coalition partners are included). Another new leftist party, Free and Equal, made up of social democrats who just couldn’t stand Renzi or the DP any longer, picked up slightly over the 3 per cent minimal share of the vote necessary to give them parliamentary seats. Since Italy uses a complex proportional representation system for its many-party elections, the most obvious electoral result is that no single party or coalition commands a majority or plurality that would allow it to easily form a government. So, bottom line: we don’t know which party/parties will govern Italy, and we don’t know who Italy’s next prime minister will be. What we do know is that Italy will likely be ruled by a melange of populist politicians, and that the negotiations to determine who will form the government could take months. But maybe mood is more important than mere votes. As the reliable Corriere della Sera op-ed columnist Beppe Severgnini saw it from Milan on Monday, “Judging by its voters… half of Italy is angry. It believes immigration is a bad thing, the European Union is a lousy deal, Donald Trump is an example of leadership and Vladimir Putin is a good man.” Severgnini duly notes that Five Star will be the largest party in the new parliament, and that the right wing coalition that scored 37 per cent is spearheaded by the League and led by Matteo Salvini, a party “that campaigned obsessively on immigration (‘Italians first!’ — sound familiar? ).” Actually, “campaigned obsessively on immigration” puts it mildly. Salvini promised what amounted to “immigration cleansing” that would comb through the urban landscape, neighbourhood by neighblourhood and street by street, in an operation that sounded more like a military mop-up than the mere setting of a restrictive policy. 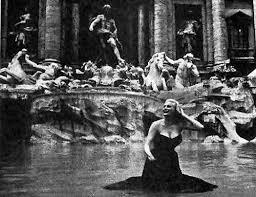 “La Dolce Vita.” Anita Ekberg in the Trevi Fountain. Similarly, if a bit more grimly, the New York Times’ veteran European columnist, Roger Cohen, noted that though Italy can survive just about anything, “having long since lost any illusions about the world,” its resilience will nonetheless “be tested by an election that has given two out-with-the-bums parties 50 per cent of the vote, pulverized the mainstream, prized vapid inexperience” and even turned former Trump White House strategist Steve Bannon into a purported expert on Tuscany (Bannon flew in and alt-right pontificated on the proceedings). Several European elections last year – in Holland, France, and Germany – appeared to stave off the high-tide of rightist populism. However, even in level-headed Germany, a home-grown populist party, Alternative for Germany (AfD), campaigning mainly on an anti-“Islamicisation” platform, took a substantial 13 per cent of the vote in the 2017 election and put a far-right contingent in Parliament for the first time since the Hitler era. While 87 per cent of German citizens cast votes for other parties, the AfD success served as a kind of warning shot across the bow of one of Europe’s most pro-democratic states. Further, subsequent electoral contests in Austria, the Czech Republic, and now Italy, demonstrate that the sea-surge of such sentiment has not receded. What’s more, worrisome as the Italian results might be, some observers are concerned by the even broader threat to liberal democracy itself. 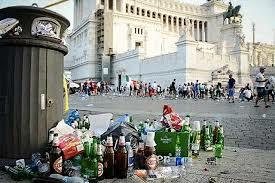 Meanwhile, back among the ruins and uncollected garbage of Rome, Beppe Severgnini’s speculation about the dolce vita turning sour is supported by the facts, especially south of Rome. “The Italian South is indeed in trouble,” he says. While the overall Italian economy is finally picking up (along with that of much of the rest of Europe), in the Great Recession years from 2008-2016, per capita GDP in southern Italy fell 11.3 per cent, in contrast with a milder slump of only half that size in northern Italy. Youth unemployment, Severgnini notes, is running at over 50 per cent in at least 3 large regions in the south — Calabria, Sicily and Sardinia. Most of the other statistics underscore the split between north and south, particularly the emigration of young people heading north (enrollment in southern universities dropped 30 per cent in the last decade and a half). Southern Italian voters are also aware that schlerotic local government, mostly run by the traditional parties – DP on the left and Forza Italia on the right — has often proved “ineffective, sometimes disastrous, and corrupt,” Severgnini adds. As Roger Cohen notes, “Italy took some 64 per cent of the 186,000 migrants who reached Europe in 2017 through Mediterranean routes. It took the majority of these immigrants in 2016, too. Promised European solidarity has evaporated; relocations have been scarce.” In addition, a lot of those immigrants have ended up in the more prosperous northern part of Italy. The deadly tension of the immigration issue wasn’t just confined to ugly rhetoric. Just a month before the election a drive-by shooting occurred in the city of Macereta in central Italy. A 28-year-old local man, Luca Traini, seriously wounded six African migrants, claiming it was a revenge attack for the murder of an Italian woman by three Nigerian drug dealers. Traini, it turned out, was an activist in Salvini’s Lega and, after the shooting, it was alleged, draped himself in the Italian flag and offered a fascist salute. The case was widely considered to have further fuelled the anti-immigrant vote. If the losers of the Italian election were the mainstream parties – as has been the case in much of Europe in recent years — the “winners” at the ballot box were the Five-Star Movement and The League, representing the country’s most disaffected voters. While the politics of the rightist Lega is unashamedly anti-foreigner, Five-Star is still something of a mystery in terms of policy. Italy wasn’t the only electoral story last weekend. At a seemingly considerable ideological and emotional distance from Italy’s excitable chaos, Germans awoke on the same Monday morning this week to a long-awaited, reassuringly more stable, if somewhat dull, political prospect. Some five months after its inconclusive September 2017 election, it was announced that the country at last had a functioning coalition government once more. Since few outside Germany are aware of, or remember, the country’s almost half-year post-election stasis, a brief reprise is in order. 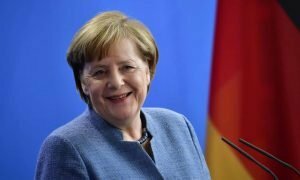 In September 2017, Chancellor Angela Merkel and her Christian Democratic Union (CDU), plus its Bavarian sister party, the Christian Social Union (CSU) — as expected — was elected to a fourth term in office. The CDU’s “grand coalition” partner as well as its chief rival, the Social Democratic Party (SPD) — also as expected — came in second. What wasn’t fully expected, however, was the sagging support of the mainstream parties: the CDU scored 33 per cent (down from 41 per cent in 2013) and the SPD garnered a record low 20 per cent of the vote (down from 25 per cent the last time around). Altogether, the German “establishment” parties saw their support shrink from two-thirds of the electorate in 2013 to just over half today. True, their decline was not as precipitous as other mainstream parties across Europe. In France, for example, in the 2017 presidential election, mainstream party candidate support on left and right collapsed completely, and the second and final electoral round run-off pitted eventual winner Emmanuel Macron, from his newly-created En Marche movement, against far-right National Front leader Marine LePen. The traditional mainstream parties didn’t even make it to the final ballot. The other result that was more-or-less expected within Germany, but which was unexpected in most of the rest of the world,was the parliamentary breakthrough of the populist anti-immigrant party, the Alternative for Germany (AfD) (mentioned above). The AfD gained 13 per cent of the vote, enough to give it over 90 seats in the 700-plus-member German Bundestag (and make it the third largest party in the country), the first time an “extreme right” party has secured such representation since the Nazi period. That was the story which quickly became headline news around the world. The issue that accounted for much of the CDU decline was, as in Italy this month, the immigration question. When, at the height of the Syrian civil war refugee crisis in 2015, Merkel daringly announced she was opening Germany’s doors, her humanitarian more-than-gesture resulted in a million refugees welcomed into the country in that year alone. It was the policy that gave rise to the present version of the AfD. Germans anticipated the AfD success, given that it already had won representation in most of the country’s 16 state legislatures, but nonetheless, people vainly hoped that the months of voter intention polls were somehow wrong. They weren’t. Other parties, all coming in at around 10 per cent, give or take a point, were the pro-business Free Democratic Party (FDP), the Greens, and the Left Party. Once more, this produced a parliament without a majority. 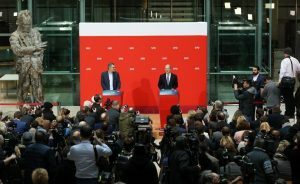 When SPD leader Martin Schulz immediately announced, in the wake of his party’s dismal showing, that the SPD was not interested in entering another grand coalition with Merkel, the search began for viable coalition partners. Schulz and his party reversed their earlier position about remaining in opposition and in the latter half of January urged an SPD party conference to authorize coalition talks with Merkel. The conference gave a fairly tepid okay (about 55 per cent) to go ahead, in the face of fierce opposition by the party’s youth wing. A month later, the two parties reached agreement on a policy package to form a coalition. The last hurdle was a mail-in vote from the party’s 450,000 members on whether to endorse the agreement. At SPD hq in Berlin, spokesmen announce coalition vote. Last Sunday morning, just as Italian voters were heading to the polls, while Germans still snuggled under their cozy duvets, SPD officials in Berlin, dwarfed by the shaggy statue of SPD icon Willy Brandt, announced that the party rank-and-file had voted to approve the coalition agreement by a solid two-thirds majority. The prospect of another grand coalition was hardly scintillating. It could even be regarded as a bit dull and stodgy in typical German fashion. Yet, a clear majority of German electors supported political “stability” – which is not a dirty word in Germany – over the uncertainty, angry voices, and fuzzy promises that mark much of European populism. The five month period of protracted coalition talks was damaging to the images of both party leaders, Merkel and Schulz, as well as to the notion of the steadiness of Europe’s powerhouse economy. For the social democratic leader, and former head of the European Parliament, Martin Schulz, it was politically fatal. His failure at the ballot box and a series of missteps in the aftermath forced his announcement that he would cede leadership of the SPD. His successor is likely to be Andrea Nahles, former labour minister in the last coalition government, former leader of the SPD’s youth wing, and generally regarded as on the left-leaning side of the SPD, and a sharp-tongued orator who might be able redefine and energize Germany’s much-weakened social democratic party. As for Chancellor Angela Merkel, instead of being seen as the undisputed primus inter pares of the EU, the honourable conscience of Europe, and a celebrated politician triumphantly wrapping up her career with a record-equalling fourth term as chanceller of Germany, she was more often viewed during the unsettling period of political paralysis as an increasingly tired figurehead. The talk focused more on this being her last tour of duty (a somewhat lame-duck one at that), and the need to think about CDU succession struggles. Yet, for all the fraying at the edges, it was the case that Merkel had patienty waited out her internal and external opponents and had again emerged as a leading stateswoman of the “free world,” or, well, freer world. Perhaps another four years of stable pro-EU government in Germany would allow it to outlive the bubble of populism, if it is indeed merely a bubble. Perhaps populists in office will quickly demonstrate – as they perhaps already have in Trump’s America – that outrage, chest thumping demagoguery, and chaotic incompetence are not really a sustainable substitute for democratic government. Perhaps even the immigration problem that has fuelled so much populist rancour will settle down in the coming years, and remove the main plank in the platform on which right-wing nationalism has stomped about. Actually, it might not be amiss to say a word about the populist public and its discontents. As Beppe Severgnini observed (above), “Judging by its voters… half of Italy is angry.” And, no doubt, so is a significant portion of other Europeans, from Brexit voters in the U.K. to Polish “patriots.” It’s mostly assumed that the anger is not only authentic but true. The question less frequently asked about all that anger is, Is it justified? Is it true that “immigration is a bad thing, the European Union is a lousy deal, Donald Trump is an example of leadership and Vladimir Putin is a good man”? Despite much of this being touted as the current “wisdom of the people,” even a cursory glance at the list of complaints and resentments reveals how shaky and partial such claims are. Just to take a less obvious example, the widespread demonization of blameless war refugees and the unthinking dislike of Others in general, is quickly brought into perspective once one takes aboard some of the facts. Consider the aging populations of Europe, the pressing need for future workers, and the fact that immigrants amount to a relatively small percentage of the population (under 10 per cent in most EU countries), and the argument becomes, if nothing else, necessarily more complex. Although anti-immigrant feeling may be strongest in the parts of Italy that has had most contact with the newscomers, in Germany it’s just the opposite. The German provinces which most strongly supported the anti-immigrant AfD party were the ones with the least number of actual immigrants. Given that Germany, thanks to Merkel’s immigrant-welcoming policies in 2015, saw more refugees enter the country than the rest of the EU put together without the nation falling to pieces, it’s clear that right-wing xenophobia is, partially at least, based on fantasy, political panic, and an exaggerated sense of losing control. To a large extent, I’d say that the populist public is, on this issue as well as many others, unduly alarmed, if not outright duped. What made me think of all this was a remark made by a British politician a week or two ago. John Major, a former prime minister, as well as a rather colourless public figure, gave a speech criticising the false claims made by supporters of Brexit – the policy which is ending British membership in the EU. Much of the “leave” EU vote was driven by anti-immigration claims, and dubious economic arguments – arguments that are now, after the fact, generating a growing degree of voters’ remorse about the whole Brexit scheme. Major, focusing on the often false beliefs acquired by populist masses, said, “It is as necessary to speak truth to the people as it is to speak truth to power.” This is a rare instance of, don’t worry about the source of the aphorism, just focus on the words. Maybe if the famous “masses” heard a bit more of the truth rather than just cranky histrionics, the promise of all-new, all-panacea political mirages would be slightly less tempting. Oh, wait. I almost forget about the good news from Switzerland. Since so little is heard from Switzerland generally, other than reports of ageless tennis legend Roger Federer winning another tournament, and the sound of wild yodelling from the country’s snow-shrouded ski slopes, you don’t want to miss this. On the same Sunday that Italians were operatically voting for populists and Germans were opting for political stability, Swiss citizens, in a national referendum, overwhelmingly rejected a proposal to cut taxpayer funding to public broadcasters, after a heated campaign about the media’s role in fostering national unity. The unique feature of Swiss public broadcasting is that it is available in the four Swiss languages: German (and a variant known as Swiss-German), French, Italian and Romansh (the last is an old Latin-based set of dialects spoken in the eastern valleys of the country). Voters were reluctant to turn Swiss linguistic diversity over to the private broadcasting market, which, to date, does not cover linguistic sectors (such as Romansh) that are not profitable. Some 71 per cent of participating voters rejected the bid to undercut public broadcasting. The head of the Swiss Broadcasting Corporation (SSR) called the outcome “a strong sign for the public service.” Backers of the attempt to undercut public broadcasting were led by the youth wing of libertarian free-market Free Democratic Party and the nationalist and anti-immigrant Swiss People’s Party. Since almost no one outside Switzerland gave this two-cheers-for-democracy anti-populist moment even a passing thought, I thought you’d want to know. Okay, Friday, Friday, here we come.